Musings of a Returning Quaker: I Want to Be Thomas K. Beecher When I Grow Up. 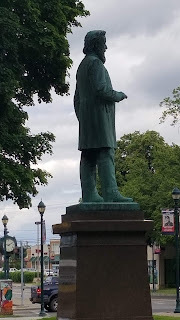 In my post Hometown Heroes I mentioned that I wanted to know more about Thomas K. Beecher. If only because one of my ancestors helped create the statue of Rev. Beecher. Rev. Beecher has a bad case of more famous older sibling. His older sister Harriet Beecher Stowe wrote Uncle Tom's Cabin. Which of course is still required reading in many schools today, over 150 years after it was published. Like her, he was an abolitionist. The Park Church that Rev. Beecher was pastor of was actually founded by abolitionists. Quite a few of the members were active conductors on the Underground Railroad before the end of the Civil War. At least 800 fugitive slaves passed through Elmira on their way to Canada. I'm positive that he had a hand in some of those activities. Rev. Beecher was also close friends with another literary giant. He would play billiards and debate with his buddy Sam regularly. Sam wasn't the church going type (I've read his "Letters From The Earth" so I totally understand that), but his wife and daughters were members of the Park Church. Why Rev. Beecher even performed Sam's marriage to his wife Olivia in her family's mansion (the current site of which is a strip mall, take that as you will). Sam is better known by his pen-name, Mark Twain. I can't help but envy Rev. Beecher's friendship with Mark Twain. I have long wished I could have gotten to know Mark Twain personally. Rev. Beecher gave the "indigent" a place to clean up and rest (which tells me how old my town's homeless population is). His study was my City's first library. He helped create the local school system. He was even a carpenter and helped the townspeople build and repair their homes. A fixer, a creator, a caretaker, an educator, and a spiritual leader. From his talents and actions, you can see that he was a man that tried very hard to follow in the footsteps of Jesus Christ. When Rev. Beecher retired as the pastor of the Park Church, he handpicked his successor and hired her himself. Yes, that is correct. In the 1890's he hired the first female pastor ordained in his denomination Annis Eastman and her husband to oversee the church he had built. Rev. Thomas K. Beecher was such an influence that even the placement of his statue was symbolic and purposeful. With his church standing behind him, and him watching out and over the town. I see so much of what I admire in a man of Faith in Rev. Beecher. I am somewhat awestruck at what I learned on the tour. While he and I are from different denominations, we both belong to the same religion. I am inspired to be a better Christian in the way he was. To do as much good, and bring as much love and kindness into the world. I know that Quakers have so many stories in our past that are as vibrant and inspiring as Rev. Beecher's is for the Congregationalists. I can't help but wonder where that spark is now for the Religious Left? Shouldn't every Friend and Progressive Christian try to be as devoted and giving as he was? Shouldn't everyone no matter their Faith or lack thereof try to live up to this example?